We're coming in hot to week 3 of the 2011 NFL season and there are some high quality matchups for you, including the first 2011 installment of the oldest rivalry in the NFL, as well as a rematch of the 2011 NFC Championship game, in Packers-Bears. Who will I pick in that one and every other game this week? Why, let us take a look. I have been very impressed with the play of Bengals rookie QB Andy Dalton, as he has shown a poise that I highly doubted I would have seen out of him. He and A.J. Green really clicked last week and I expect more of the same this week. The 49ers really surprised me in how well they played last week against Dallas but I think that Alex Smith will make a couple of mistakes and swing this one to Cincinnati. Okay we all know the Chiefs are pitiful but you have to be impressed with how the Lions have started off 2011 and in particular Matt Stafford, who has been awesome. Meanwhile the Vikings have started off their games well but have fallen off big time in the second half, losing both of their games that way. I think this will be a close one and Donovan McNabb will play like he did last week instead of week 1 but I don't think it will be enough in the end. The Giants defense looked a lot better against the Rams on Monday night than it did in their opener against Washington. They may get lucky if Michael Vick does not start for the Eagles which will leave either Vince Young or Mike Kafka, likely Kafka, as the starter. Now Kafka was not bad against Atlanta but I do not think he would fare too well against the Giants pass rush. Just a hunch. We have seen two very different performances from Chad Henne this year. He was very impressive against the Patriots and was mediocre against the Texans. The Browns have been similarly inconsistent but they do have a victory. However I'm expecting a big day from Daniel Thomas and Henne will play decent enough to give Miami their first victory. The Jaguars cannot start Luke McCown again and I'm fully expecting Blaine Gabbert to be under center and make his starting debut. No way they can expect him to be as impressive as Cam Newton has been who despite being 0-2 has put up impressive stats and have given his team a shot at victory. I think this is the week that Newton gets his first NFL victory. Both of these clubs are coming off nice victories last week, although Tennessee was much more impressive in completely manhandling the Baltimore Ravens with an impressive display from their offensive line. I think you will get a big performance from Chris Johnson and the Broncos will not have an answer. You cannot discredit has well Ryan Fitzpatrick and co. have played this year. The Bills have had two quality wins and may surprise some folks this year. But Tom Brady and the Patriots have looked like machines this year, throwing downfield at will. I think this will be an old-fashioned AFL shootout but the Bills just do not have the weapons to keep pace. We got this really good offenses going at it in this one and it is shaping up to be a showdown between Drew Brees and Matt Schaub. Both teams have also gotten some quality production out of their running games as well and the defenses both have shown a lot of potential as well. That said, I give the ever so slight advantage to Brees and co.
Sam Bradford has been very hit or miss this season and inconsistent quarterback play is not ideal for when you are playing the Ravens. Especially a club coming off a really disappointing loss to the Titans. I think the Ravens are going to rattle Bradford and force him to make mistakes, which Joe Flacco and Ray Rice will promptly take advantage of. I've already talked about the Chiefs' deficiencies. There is one thing that does not bode well for the Chiefs, apart from everything wrong with the club, is that their secondary has been pitiful. Saying that, Philip Rivers is drooling at the opportunity to take on this defense. The Chargers are my Lock of the Week. The Jets defense was absolutely dominant last week versus Jacksonville (although Luke McCown was starting for the Jags). When this defense is cranking, you cannot move the ball at all against them. Every once in the while, the Raiders will surprise the Jets and make it competitive but I don't expect Rex Ryan's boys to let up. Now normally I would actually pick the Seahawks in this scenario since they are a very good home team. However, this 'Hawks team has looked pretty god awful this year and Tarvaris Jackson has been a mess at quarterback (what a surprise). Kevin Kolb will hook up with Larry Fitzgerald on a couple long balls and the Cardinals will roll. Matt Ryan came back from a mediocre week 1 to have a tremendous performance against Philadelphia. The Falcons were wise to focus the offense on him and he showed how well the offense can operate when he is the centerpiece rather than Michael Turner. And I do like this Buccaneers club and I love Josh Freeman. But the Falcons have the talent edge and thus the edge in this game. It's always a dogfight when these two great rivals duke it out as they have for 90 years. Da Bears looked really out of sync last week in New Orleans and I do not expect a repeat performance like that. 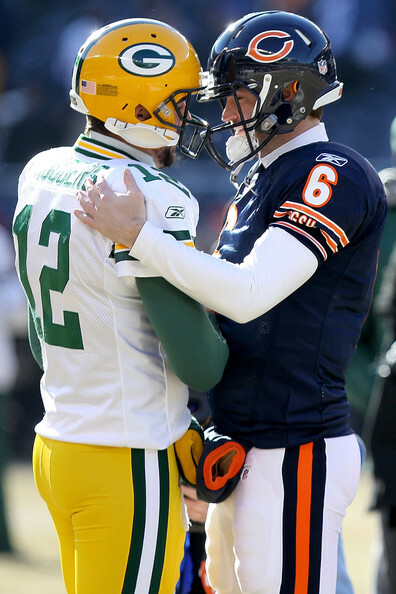 I think the Bears will control the clock with Matt Forte and keep Aaron Rodgers on the sideline while Jay Cutler makes some smart decisions (it can happen, folks). The Steelers looked dominant last week, controlling the clock on the ground while Ben Roethlisberger made really smart decisions throwing the football. I expect more of the same. I also expect more of the same ineptness from Kerry Collins and friends for Indianapolis as that team is just a mess. Rex Grossman's solid play has to end some time? He has to revert to old Rex eventually, right? I agree on both counts. I think you will see Grossman make the mistakes of old and cost his team dearly. Meanwhile Tony Romo will take advantage and dominate the Redskins secondary.